We started talking about the story of Thanksgiving this week for our Thanksgiving theme. Each day we are learning a little more about the story and adding a few more beads to our story bracelets. Although it is a little advanced for my little ones, we have been enjoying and learning from the information in the Interactive Exploration of the First Thanksgiving. We also continue to sing our Thanksgiving songs. 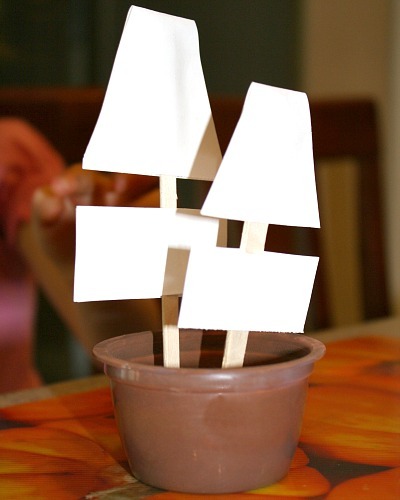 Our first craft was this super easy Mayflower craft. 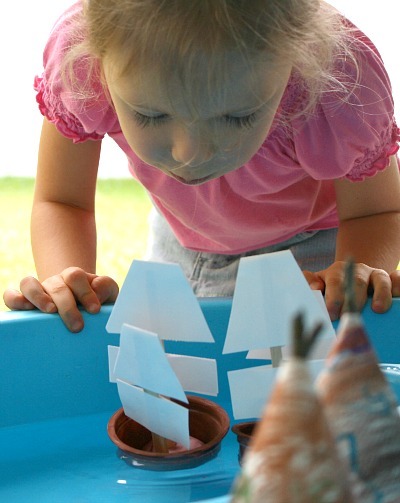 I adapted these egg carton pirate ships just a bit so we would be able to put them in water. First the kids used brown paint to paint the inside of an empty applesauce cup. All we had to clean up were the paintbrushes, because the kids just squeezed a bit of brown paint right into the cup. Then we glued trapezoids and rectangles made from card stock to two different sized craft sticks to create the sails. When our paint was finally dry, we added a small amount of play dough to the bottom and used it to secure our sails. See! Super easy! 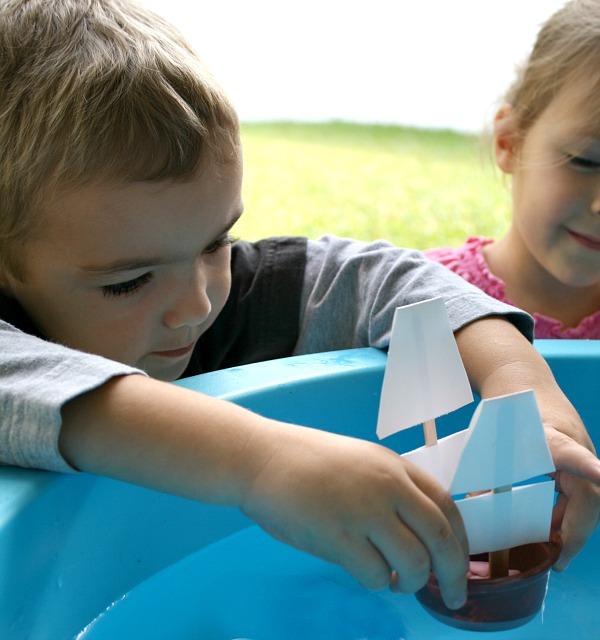 It didn’t take long for the kids to ask when we were going to sail our ships, so we filled up the water table and prepared to set sail. 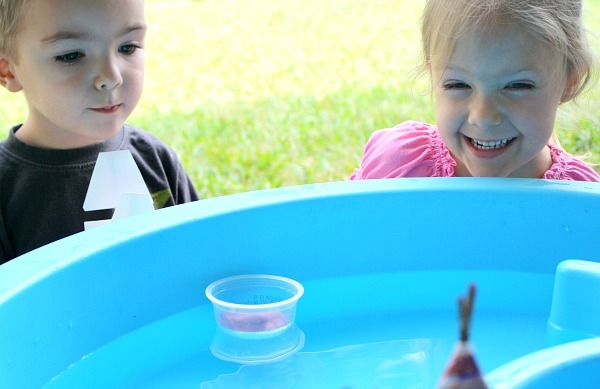 My little scientists predicted that these boats were not going to float, so they decided to put Tinker’s boat in first. Hers didn’t have any paint, and we could make her a new one if we needed to. Not quite sure the boats would float myself, I thought this was a good idea, and we were all a little relieved surprised when the boat didn’t sink. 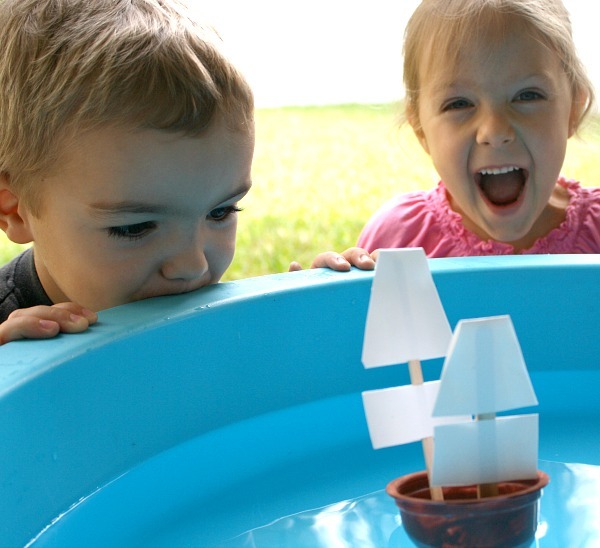 Then we tested the other boats, and the kids were as excited to see that all of our mini-Mayflowers could float. Remembering our talk about the long trip and the weather during the voyage, one of the kids said, “Hey! Let’s make it storm.” They spent a few minutes blowing on the boats and moving them across the water. It didn’t take long for them to realize they had to blow a lot harder to move Tinker’s boat (the one without the sails) than they did to move their own boats. This gave us a great chance to talk about the function of sails. 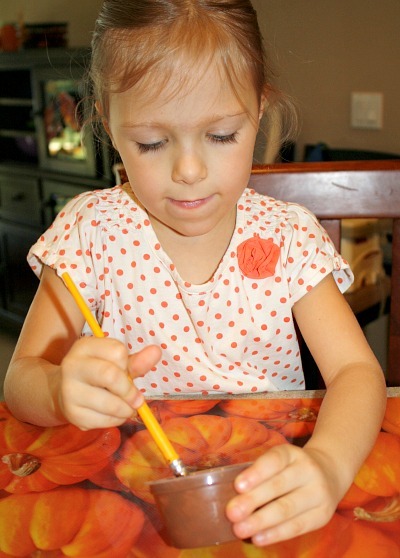 How do you teach your kids about the Mayflower? 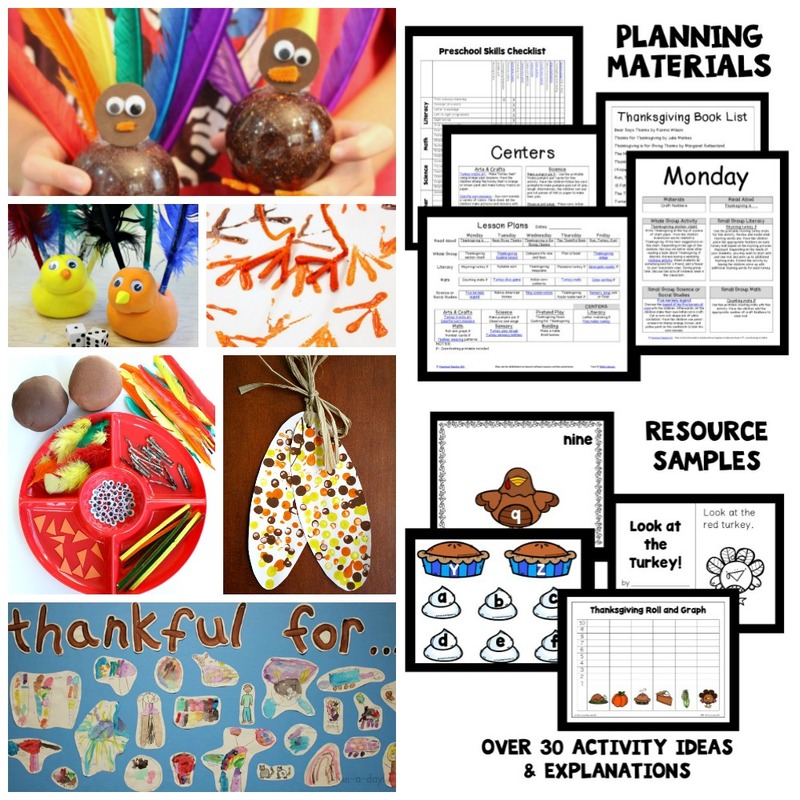 What other ways do you incorporate science into teaching about Thanksgiving? Thanks so much, Rachel! I hope your daughter has fun. I love your cute Mayflower craft! 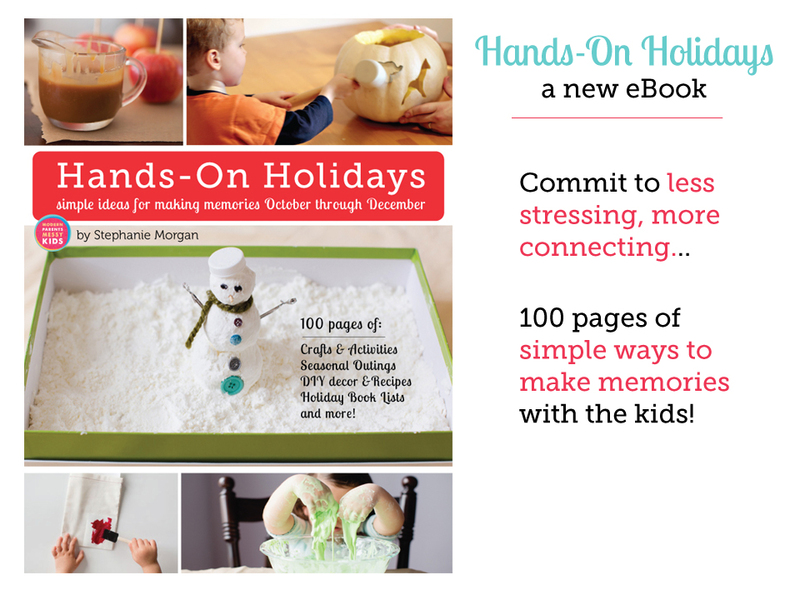 I know my daughter will love it, we might have to do it this afternoon! Thanks! It was really fun for the kids. Let me know if you do try it out. I love the science connection! My girls will enjoy this. Thanks for the great idea! Thanks! Come back and let me know how it works out. How fun! Last year we built The Mayflower from a little wooden kit ($1 kit at AC Moore) and this year we drew The Mayflower for our art lesson! Awesome! I like the book suggestions you shared in your post, too.